I’ve been buying frozen turkeys for Thanksgiving my whole life. This is a tradition handed down through the generations. My mom always bought frozen turkeys for Thanksgiving. HER mom always bought frozen turkeys for Thanksgiving. And on and on. My family is more the gathering type than the hunting type. My ancestors were sheep herders, the types of people who led the lambs to the slaughter, so to speak, without doing any of the actual slaughtering. Having lived in Clark County for nearly twenty years now, the influence of our neighbor to the south has been rubbing off on me. Words like “free range” and “organic” have steadily crept into my vocabulary. I have often wondered whether a fresh turkey was superior to a frozen one, and this year, I decided to find out. I headed to New Seasons on 164th Ave. in Fisher’s Landing. I love this place, and used to make pilgrimages to Portland in order to shop there. Thankfully, we’ve got our very own store in Vancouver now! They were selling fresh, free range Diestel turkeys for $1.99 a pound – twice what I normally pay. But we have become the de facto hosts of Thanksgiving over the years, and I could justify the cost by maintaining we wanted to serve the tastiest bird possible to our guests. Plus, my mom offered to buy it. Score! Sadly, the turkey wasn’t local – it came from a farm in Sonora, California – but many of the other ingredients were. A trip to the PSU farmer’s market last weekend yielded: chanterelle and oyster mushrooms for the stuffing, Yukon Gold potatoes for mashing, and a variety of fresh veggies (celery, carrots, etc.) for dressing the turkey and landing on a relish tray. This made me very happy. The focus of this blog is going to be regional cuisine of the Pacific Northwest, primarily Oregon and Washington, and I strive to buy local whenever possible, despite any additional cost. Peek inside my fridge and count all the Tillamook products if you don’t believe me! I’ve been brining my turkey for several years now, and swear by the results. 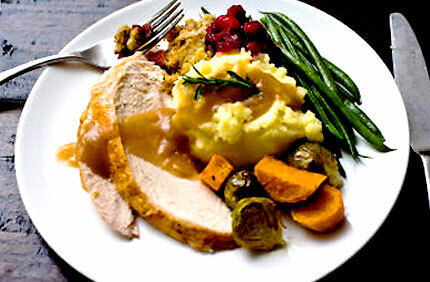 Brining causes muscle fibers to absorb liquid, reducing the amount of moisture loss during cooking. The end result? A moist and juicy bird. At its most basic, a brine is a mixture of water and salt, but you can add or substitute other ingredients to your heart’s content. Mine includes apple juice, brown sugar, orange peels, fresh rosemary leaves, bay leaves, garlic cloves, peppercorns, and brown sugar. Let your turkey brine for at least 16-24 hours for best results. After removing it, rinse and pat dry. (The turkey, not you – unless you’re perspiring). We prepped the brine Tuesday night, then gave the turkey a 36-hour bath. Time to let the tryptophan work its magic! Thanksgiving arrived, and after we brined, we wined and dined. On Turkey Day, at least, the old mantra “it’s 5:00 somewhere” doesn’t apply because it’s sort of 5:00 all day long. Hiccup. Anyway, the result of the free range fresh bird? Spectacular. It was moist, juicy, and delicious – even the white meat, and that’s a hard feat to accomplish. Everybody “gobbled” down seconds, and we all slipped into our own tryptophan-induced food comas as the day wore on. After this experiment, I’m a convert. 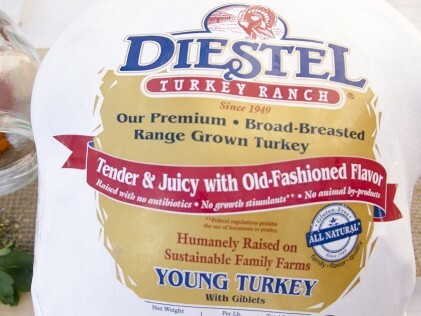 It’s going to be fresh – never frozen – turkeys for me over the holidays from now on!